The domestic and international both passenger traffic is expanding day by day and thereby the number of baggage too, which is handled by the baggage conveyor system, however the belt used in this system fails on the expectation of the aviation industries due to the heavy load, abrasion and continuous operations, resulted in the huge break down, which is miserable for both, the customer and aviation industry. With a purpose to sort out the conveyor belt associated issue of the aviation industries, we are here with the premium quality conveyor belt for the baggage conveyor system that is built to outperform even under heavy load, high impact and continuous operations. The offered conveyor belt for baggage handling system is made from the vulcanized PVC/PU material that has austerely tested against the impact strength and the hardness to ensure it’s withstand ability against heavy loads. This conveyor belt for baggage handling system meets the safety and reliability standards of the international bodies, already being used by the many of the aviation industries and is applauded by thereof for its superlative performance all through. 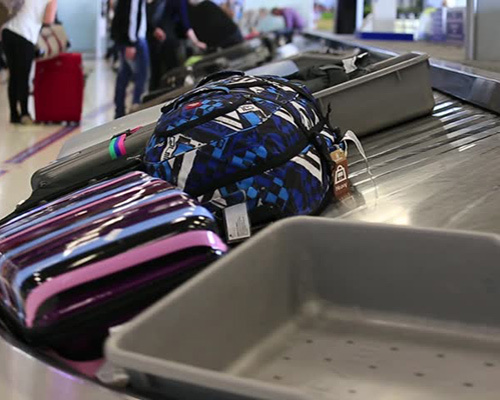 There is no issue associated with conveyor failure or baggage bump or drop is determined throughout its usage and hence is successful in gaining the trust of the aviation industries for its worthiness. The excellent abrasion & cut resistance are the strong points that ensure longer service life and unfailing operations spanning the years. We make this conveyor belt for the baggage conveyor system available in the different dimensions and with different types of profile patterns so as one can select the best suited for their baggage conveying needs, whilst the tailor made range of the same is also available at the most competitive rates in the market.